Mirror Models is relative newcomer to the scene of armour model producers and the company clearly knows how to attract attention. Its choice of the first models to be offered to modellers definitely made it stand out of crowd. 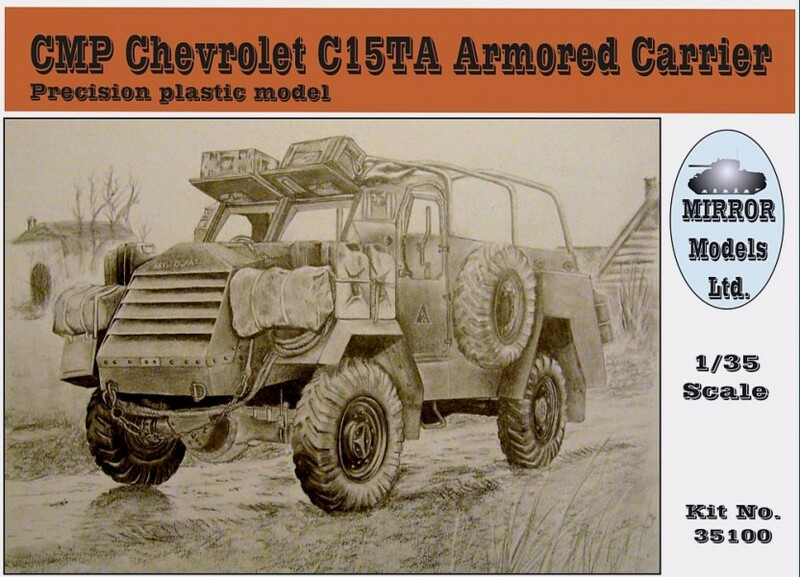 The series of vehicles based on the Chevrolet C15A Canadian Military Pattern truck chassis it plans to release was never before released in 1/35 scale, so the promise of success is there. The box itself is rather small compared to the standard size used by model companies these days, but open opening you will find out it is fully stuffed. The kit is real multimedia offering, it includes resin, plastic, clear plastic, and photoetch parts. 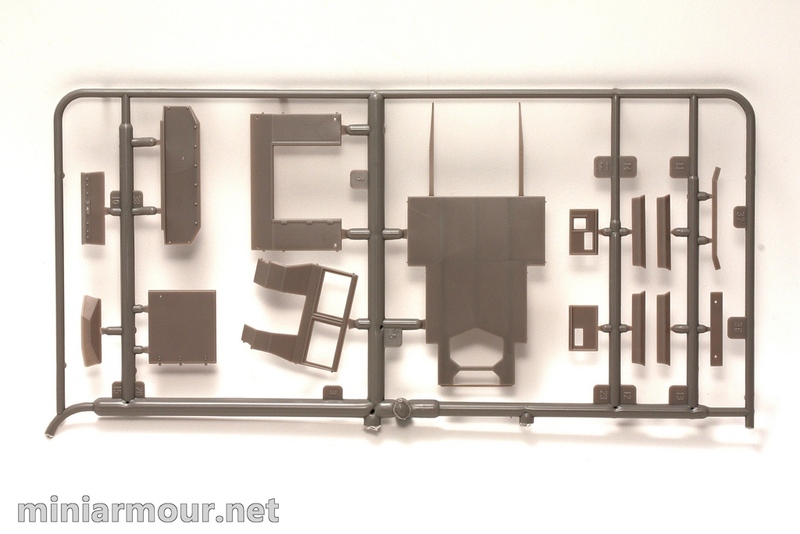 Included are also number of smaller pieces – wires, plastic rods and of course large decal sheet. Instead of the traditional instruction sheet you will find enclosed CD disk. 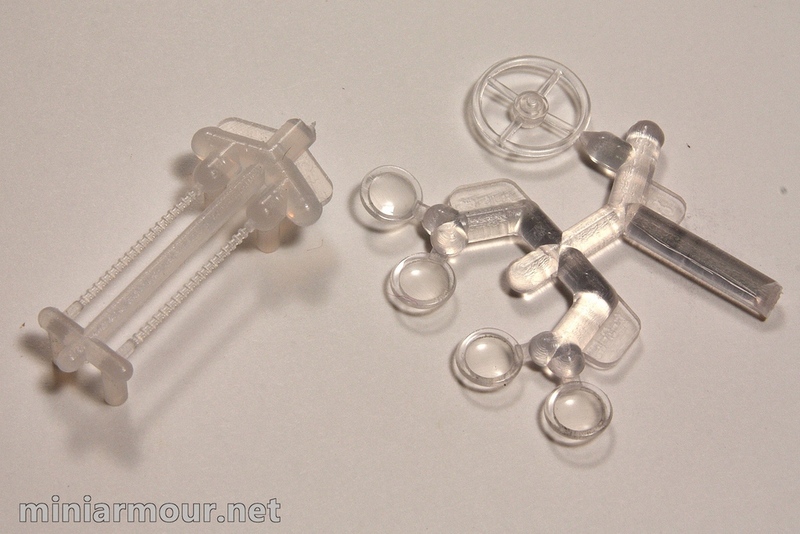 Plastic parts are molded on 5 sprues and I counted 84 parts altogether. Molding is good with clear sharp edges and no flash. Level of detail might not be at the level of say Dragon’s models, but is still very fine. 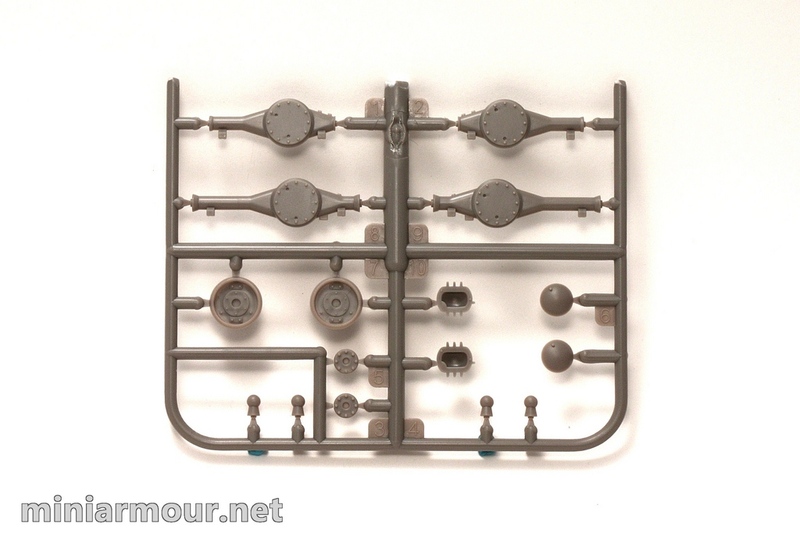 I like that sprue attachment points are small and thus parts cleaning should be straightforward business ( I would even say that even some large established producers could learn something here). Plastic parts have quite a few ejection marks on the inner sides, but these seem to be rather shallow and should not be too difficult to remove. I cannot judge fit of the parts as I haven’t attempted to build any part of the model. 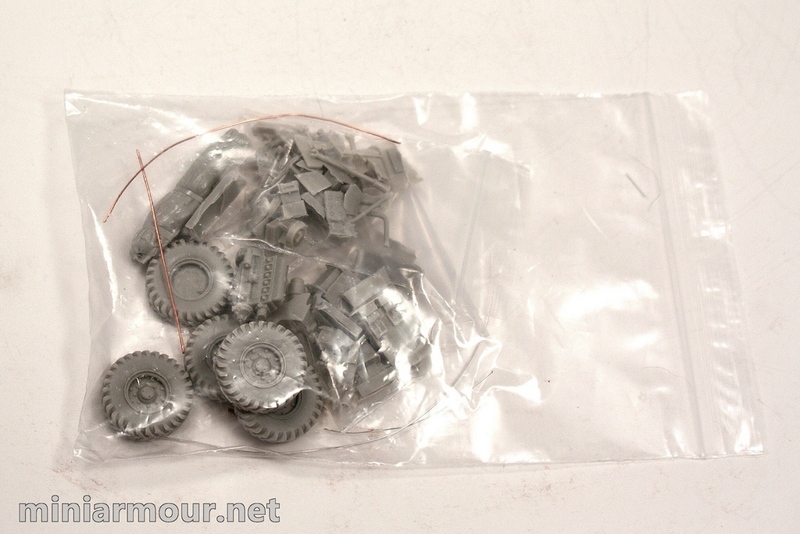 Resin parts are wrapped (as all other pars) in ziploc bag and include a lot of smaller and finer parts. The largest are the wheels (5 of them) and engine, the rest seem to be miscellaneous detail parts. 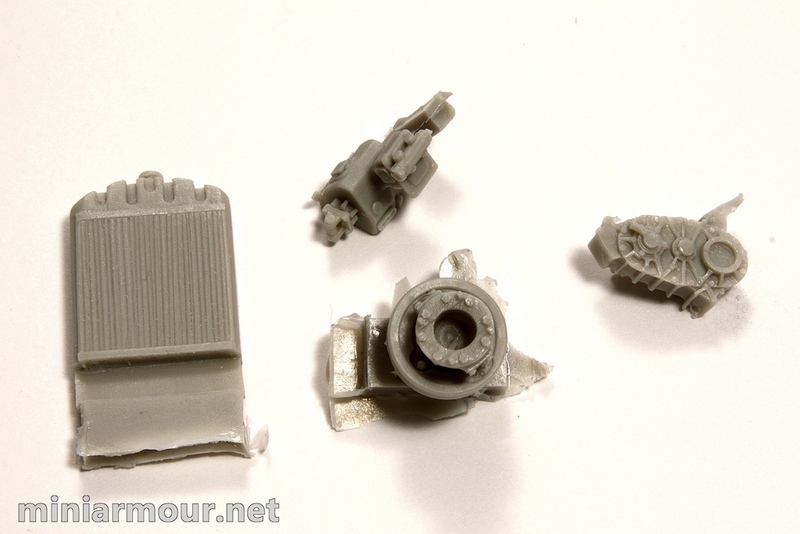 Casting is fine with minimum cleaning needed, however careful handling will be required as most of the parts are really tiny. 3 photoetch sheets are included, one large and two smaller ones. Again, the level of detail is very good, with nice surface textures on some parts (floor sections). Overall quality is at the standard level you can expect these days. 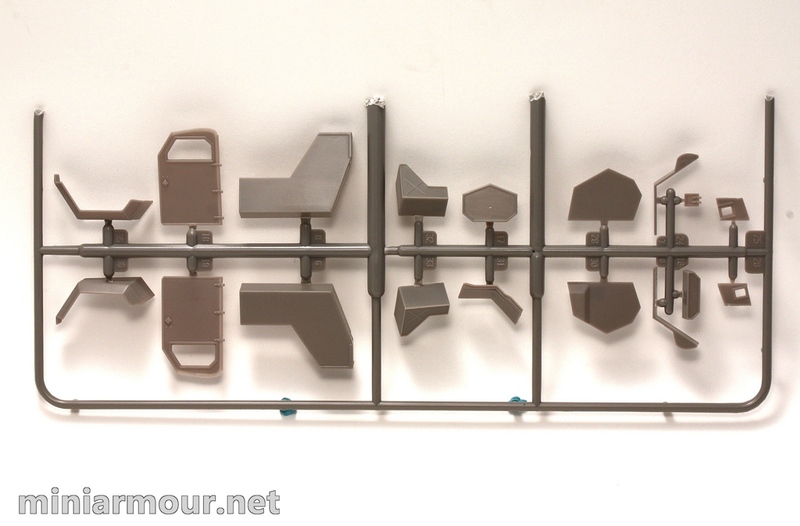 It is interesting that in addition to all the detail parts included in the base kit, Mirror models is separately offering additional detail products you can buy to detail up the model such as Detailing set with 13 resin parts and 40+ photoetch parts. 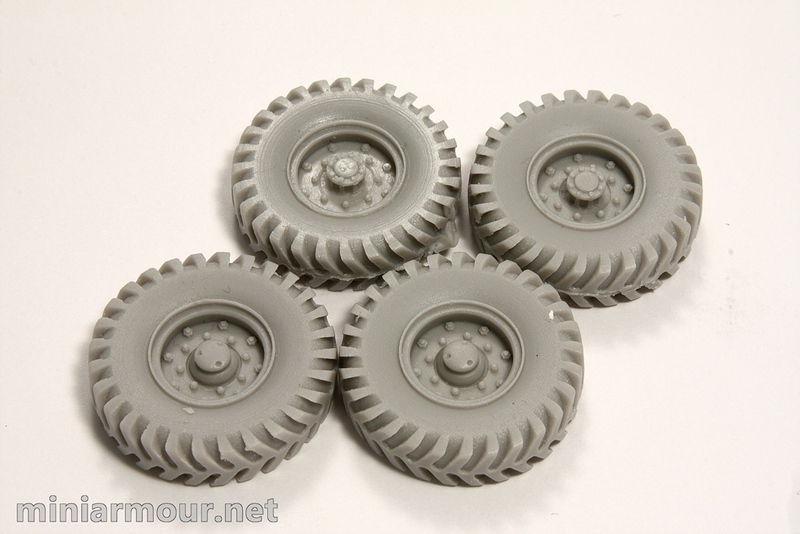 Quick glance at the pictures of this set reveal that some parts are intended to replace plastic parts included in the base kit (such as fenders) and some are additional. 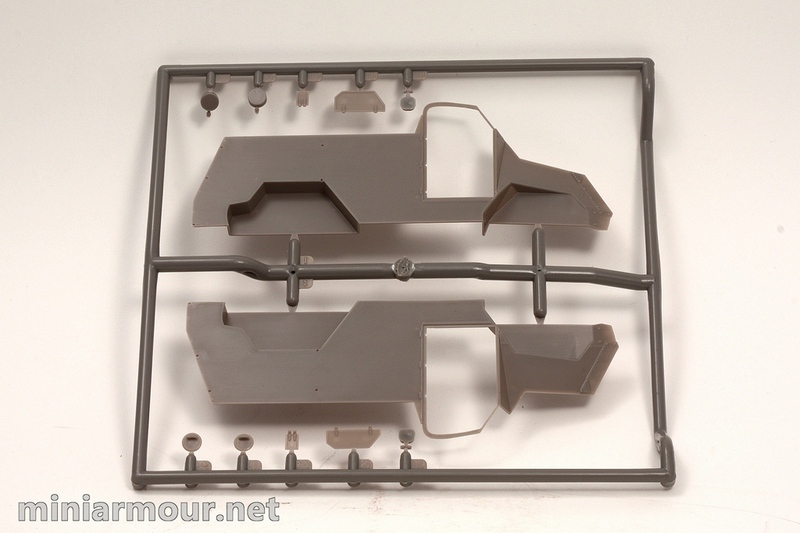 I also noticed that to be released soon is also canvas, which was widely used on this vehicle and can be seen on many of the original pictures from the ETO (note that the base kit does not include support brackets for canvas). As noted before, you won’t found any instruction sheet in this kit, CD is included instead. I don’t mind and can understand that this cuts some buck from the price of the kit. On the CD you can find file in PDF format. The file shows on 37 pages (!) detailed process of construction, lavishly illustrated with photographs, with the individual parts clearly identified and offering number of views how the assembled parts are to look. Compare that to the usual 2 or 3 letter size pages that you get for even more complicated Legend production sets. 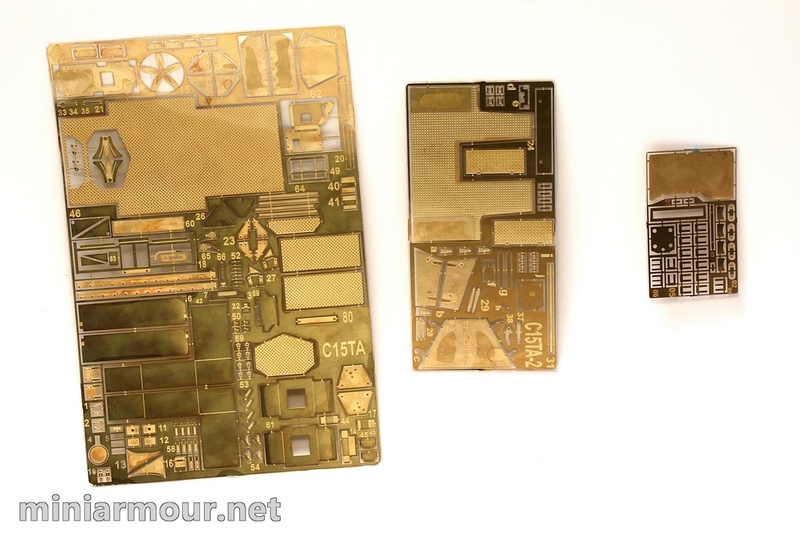 I personally appreciate that all photoetch parts are pictured how they should look once bent into shape. 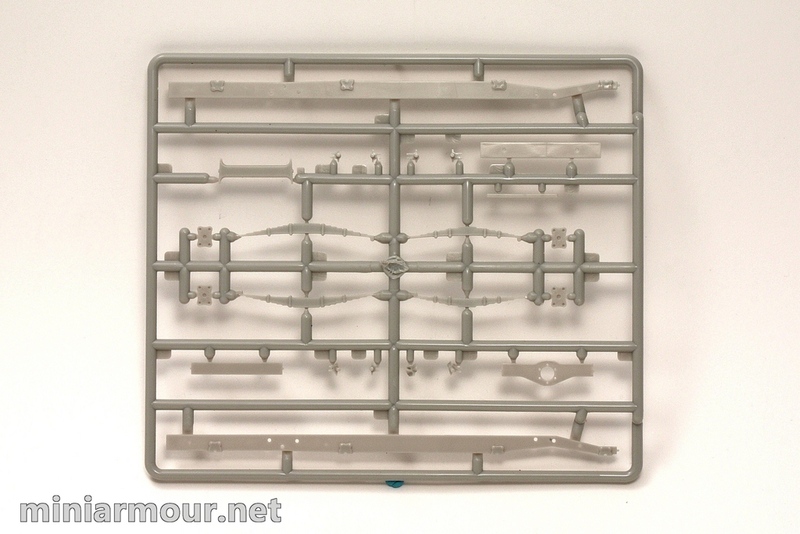 One thing is clear from the pictures – the construction of this model will be more similar to the resin models than the plastic one, with some details to be added using wires, plastic rods, etc. There is one significant disappointment with this kit – the instruction sheet basically omits any instructions regarding the markings and painting and use of the decals. There are 4 views provided for 2 versions of the vehicle provided with the identification of the unit, but no reference on which of the decals are to be used for them, so you will have to guess for yourself. Plus there is a lot of decals on the sheet, for which no information is provided as well as markings, which are depicted on the views, but are not included on the decal sheet. The instructions basically tell you to buy a book from Capricorn publications as a reference. Personally I consider this to be significant disappointment as I don’t like this way of being forced buy the book – regardless of its quality. The decals mostly seem to be well printed, though some of them, such as bridge classification markings have the numbers bit off centre. Also marking of the 5th Canadian Armoured Division (if that’s what it is, as there is no decal identification provided) has wrong colour – it is bright red, whereby the colour should be maroon I believe. I do not make any call regarding the construction and fit of the parts as I have not attempted to build the kit. To wrap up, the kit offers very good quality of parts, lot of details and of course is the only kit of this vehicle on the market. The instruction sheet provides the best illustration of the construction process I have seen. Again, without the decal disappointment, I would recommend this kit without reservation. As it is, you may have to include the purchase of the above mentioned book into your cost calculation. For me, because of the subject, this kit is still a must have and I will definitely be getting the other versions as well. Even though this is not a “first time ever” on this kind of kit (plastic, resin, and photoetch), I do believe it is a fresh breathe of air as a Model kit, one with a very reasonable contents for the price. It is also an unusual and improbable choice of subject, and a very interesting one. I also have one of these on my stash now. 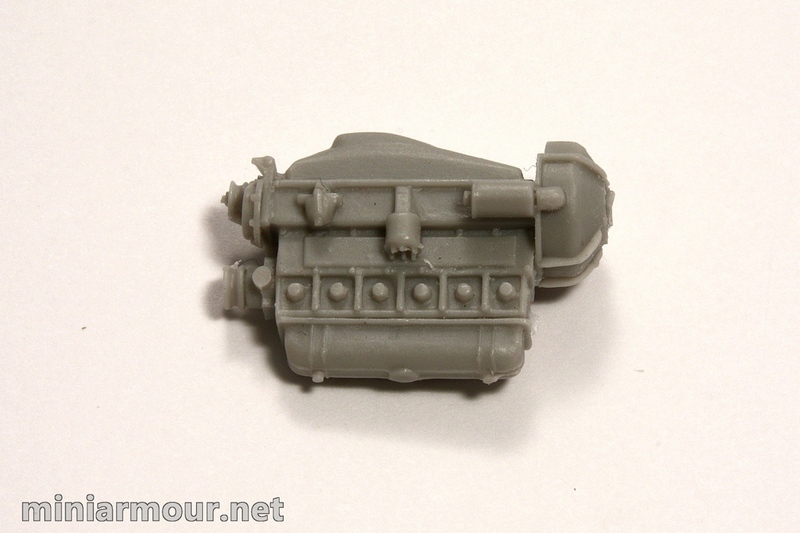 As for the plastic parts, I think the machinery and technology used could be outdated, and also found that there could and should have been a little more detail engraved on these parts, especially on the inside of the vehicle. But it is to me a must have kit in every other aspect, i love the “beautiful ugliness” and character of this vehicle, and it is a very complete multimedia kit. Worth every cent!